I was a bit late getting to the draw this morning and as I walked into the pub I was greeted with a huge cheer! There was another good turnout of twelve anglers today and over the course of the league we’ve had twenty different anglers fish, which is fantastic to see and just goes to show what a great little venue the pond is. The draw was announced and by the time I stuck my hand in the hat there were only a few pegs left. I opened my hand to reveal the number 24, it can be a great peg as there’s a bush to your left which is home to some big chub. It’s a classic hero or zero peg and to be honest I try and avoid the bush as I think it’s too much of a gamble as you can spend too long looking for a bonus and if you don’t get one you’ll finish up way behind the roach anglers. One of the last times I fished it I had a lovely day catching quality roach and rudd and even added two chub from open water for a win with 22lb 8oz, so a similar day would be very nice! 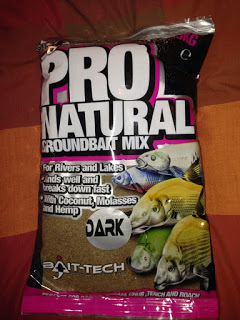 I mixed up some groundbait (Bait-Tech Pro Nat Dark of course!) before setting my rigs up, a Preston Chianti for fishing shallow and a 1 gram Drennan Tipo for fishing on the deck at 10 metres. I was just about ready in time and on the whistle I cupped in two balls of groundbait containing some maggots, casters and hemp. I shipped out and started getting bites straight away with a succession of 1-2oz roach but I did bump a few and had several come off as well. 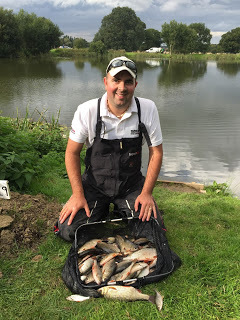 Ashley Tomkins on peg 19 was fishing shallow and catching a few, the other anglers I could see, Leighton on 22, Frank on 18 and Stu Alford on 14 were all fishing the feeder. I had 22 fish after an hour but only a couple of the better roach, Ash had netted several but at this early stage there wasn’t much between us. I was feeding hemp and caster and odd fish could be seen swirling for the loose feed so I reached for the shallow rig to try and up my catch rate or get a better stamp of fish. First put in I had a good roach but then started missing bites per usual, I would get the odd net roach among the smaller ones and by the end of hour two I was up to 40 fish and still doing okay from what I could see. Stu had landed a decent bream and Big Frank was catching some nice skimmers but nobody looked to be running away with it. As the third hour began I was still getting loads of indications shallow but I just couldn’t hit them, I tried changing depths and moving the shot around but I’d gone from doing okay to really struggling. I only added 8 or 9 fish in the third hour and despite trying the deep rig, it was a similar story in the fourth hour as well. Ash was still catching in spells but it looked like the feeder boys were now struggling and Stu Alford was even fishing the pole! I was going nowhere fast so with two hours left I felt I had to have a go for those chub. I dug out a rig with a 0.4 gram Drennan Carp float to 0.14mm bottom and a size 16 Kamasan B911 and plumbed up by the bush at 8.5 metres, I cupped in two full pots of maggots, casters and hemp before going back out on the shallow rig for 15 minutes to let my new line settle, I added a couple more small roach but I knew I needed a couple of bonus fish if I was to do any good today. I slipped on two casters and shipped out, I had a couple of bites quite quickly that I missed which I think may have been smaller fish before the float sailed away and the strike resulted in a good fish on, I got it away from the bush and then had to stop it going under the irrigation pipe to my right. 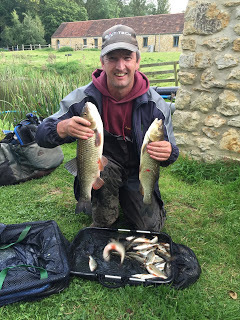 It plodded around in front of me before coming to the top, it was a cracking chub of 3lb+ but as I shipped back to get to the pulla kit, the chub found it’s second wind and went straight under my keepnet snapping my hooklength in the process – bugger! I put in another potful of bait before sorting the rig out and tying on a new hooklength, I was getting quite a few bites and landed three or four decent roach but I needed chub so I put in another pot of feed in. The next bite saw me hook another big fish and I stuck the pole tip under the water and swung the pole round to the right but to no avail as it found the sanctuary of the branches and I was left pulling for a break. This wasn’t going well and with the score 2-0 to the chub, I cupped in some more feed and sorted the rig out yet again as we headed into the last hour. Ash was still getting some quality roach but everybody else seemed to be struggling and a couple of chub would get me right in the mix but that was easier said than done at the moment! I actually managed to land the next one, a rather hollow looking chub of 2lb or so and there was still half an hour to go, my next fish was an 8oz roach but I wasn’t getting as many indications now and time was running out so I put in another big potful of bait. I kept thinking that I wasn’t going to get another chance when with five minutes to go the float disappeared and on the strike, my Preston Green Hollo elastic streamed out of the pole tip. I gave the fish as much welly as I dared and as it came to the top I stood up so I could ship back to my top kit but this one tried the under the keepnet trick as well but I got it out and safely netted a good chub of well over 3lb and I even let out a little whoop! I still had time to go back out again and I missed another bite before Rob blew to end the match. I ended up with 62 fish (2 chub for 5-6lb and about the same weight of roach), so around 11lb and I just knew that first chub I lost was going to cost me. 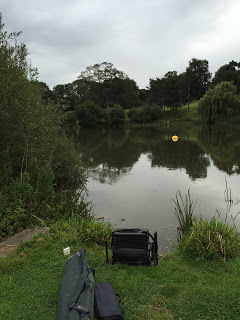 I had the scales so packed up and walked round to weigh in, Bob in peg 12 had packed up early and then Stu had a bream and some good rudd for 11lb 11oz, Frank had a nice net of skimmers for 12lb 14oz before Ash pulled his net out and he had some clonking roach and weighed 16lb 10oz (although he was only admitting to 8lb!). 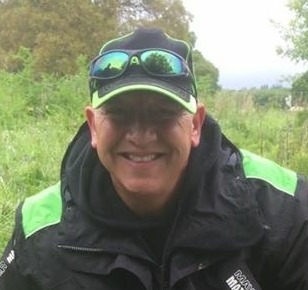 Leighton on peg 22 didn’t weigh and then it was my turn, I knew I hadn’t beat Ash but when I pulled my net out it looked like it might be close to Frank and Stu’s weights, the needle settled on 12lb 7oz to put me in third place on our side. Out of interest I weighed the bigger chub and it was 4lb exactly which is a new personal best for me. I drove back round to meet the rest and the other section hadn’t fished that well with Fieldy having the top weight with 8lb 9oz from peg 6 which meant I’d finished in third place and picked up £25 plus a nugget off Mr Parker. 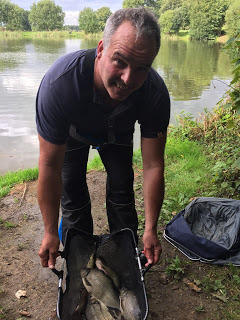 So a pretty good day although I should have done better, I lost enough to have won it and perhaps if I’d gone by the bush an hour earlier I might have a had a couple more, but with the benefit of hindsight we would all fish the perfect match! 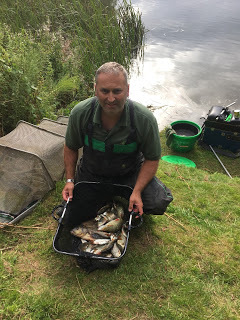 As Graham won his section again today, he was crowned the Summer League Champion, another great performance from a very consistent angler, he targets small fish and is very good at what he does, resulting in an envelope nearly every match so credit where credits due, well done mate. Frank finished second in the league with Stu Alford third. The club would like to say a massive thanks to Rob Cox and Stuart Alford for running another excellent league and also to Steve and Cindy at the Royal Oak for looking after us in the mornings. Also I had a lovely cut out peg this morning which I think is down to Scotty Jackson and Dave Sydenham who do loads of work out the pond and deserve a big thanks for that and everything they do for the juniors.